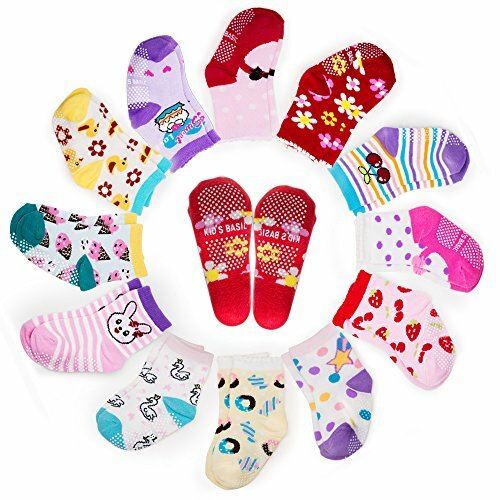 ❤ Non skid socks toddler material: 85% Cotton, 10% polyester fiber, 5% Spandex, they are very soft，high quality and comfortable to wear. ❤ Adorable Cartoon Pattern, looks cute and keep little toes warm in style. ❤ These stretchable socks have a foldable brim for maximum comfort provides the warmth and protection during sleep and play time. ❤ The beaded PU bottom provides great grip and support for your walk active toddler while keeping comfort. ❤ For season: Spring,summer,autumn and winter. - Care Instructions: Machine wash cold. Tumble dry gentle, low heat. ★These gender neutral baby non skid ankle socks are very comfortable, it can wear outside, home, indoor, outdoor freely without shoes.These toddler socks with grip can prevent your baby fall off on the smooth floor, no worry about slipping in the kitchen or bathroom. ★ Comfortable & Durable Material>> Made of premium quality breathable Cotton, Suitable thickness for all seasons, absorb sweat, odor resistant,very comfortable soft and warm. Durable enough to last through a lot of wear . ★ Valued Pack & Perfect Size Socks or Babies>> 12 pairs color random cute animal toddler socks. Sole length : 3.5-4.7 inch / 9-12cm. No stretch is 3.5 inches, stretching to 4.7 inches. Suitable for 1-3 years old (12-36 months) baby to wear. 1-3 years old is Recommended Age, please refer to the length of specific before ordering. ★ Good Elastic Baby Walker Anti- slip Sock Gender Neutral>> This Anti-slip socks are safety for baby walkers and toddlers. With grips keep your baby warm and prevent from sliding or falling in hard cold floor. Grip design is very practical for the rapid growth in babies. ★ Baby Socks are Very Cute & Classic Cartoon Pattern>> These adorable baby socks with grips and colorful cute animal designs, they are suit for toddler walker boys and girls, they are also very nice gift for baby shower baptism. ★ Baby Cotton Socks with Moderate Thickness Ideal for All Season>> With moderate thickness suit for spring, summer, autumn, and winter. You also could choose for your child's, as birthdays, Christmas gift. or as child's socks gift. baby always need many socks to replace, so this baby walker socks are best choice to order. If you have any questions about this product by YIMALER, contact us by completing and submitting the form below. If you are looking for a specif part number, please include it with your message.